The second of the meetings in Greasby (and the fourth consultation meeting overall) was held in Greasby Methodist Church Hall, Greasby Road on the 10th November 2014 starting at 7.00pm. The main hall was packed with many people (as you can see from the photo below taken shortly before it started), so were two overflow rooms in the same building. The purpose of the meeting was as part of the 12 week consultation on the closure of Upton and West Kirby fire stations and the creation of a new fire station in Greasby on the Wirral. This came about following a decision of the Merseyside Fire and Rescue Authority on the 2nd October 2014 to proceed to consultation. Chairing the meeting (which started later than the time it was supposed to of 7.00pm) on the 10th November 2014 was Peter Rushton (Director of Corporate Communications, Merseyside Fire and Rescue Service). He introduced Dan Stephens (Chief Fire Officer, Merseyside Fire and Rescue Service) and stated that there were a number of senior managers of the Merseyside Fire and Rescue Service also present. 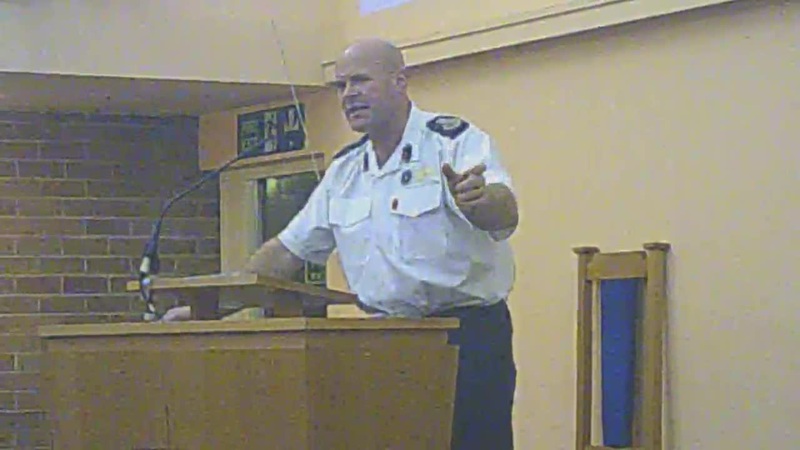 Peter Rushton said that there would be an opportunity during the meeting to make comments and ask questions of the Chief Fire Officer (Dan Stephens). Dan Stephens would be giving a presentation on what the consultation, however Mr. Rushton made it clear that it was not a planning consultation. 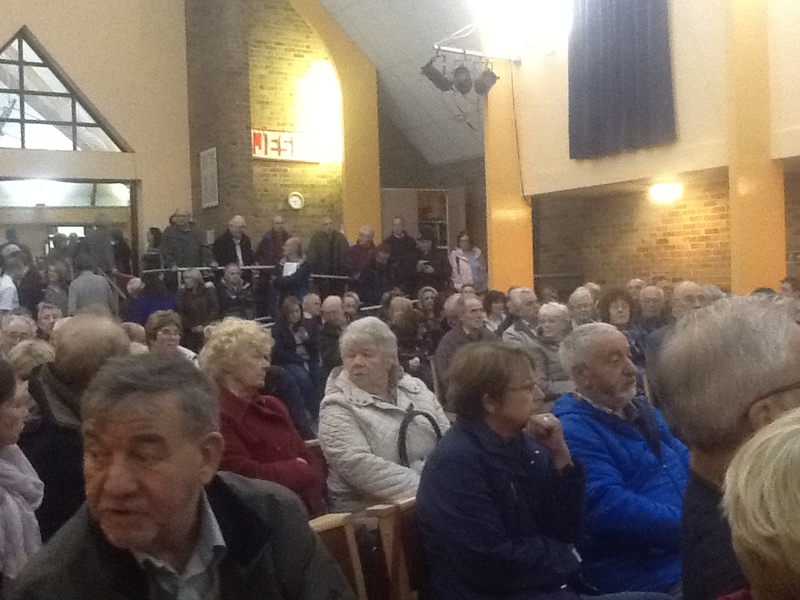 He said this was the fourth public meeting and the second meeting in Greasby. He asked anybody speaking during the meeting to use the microphone so everybody could hear and take part. There were two other rooms also full of people and he hoped as many people as possible would fill out the survey forms on the tables and they would like people to fill in. Mr. Rushton said that he intended to finish the meeting by 9 o’clock. The Chief Fire Officer, Dan Stephens said that he didn’t control the presentation, so he would ask his colleagues to move slides on. He said that at the risk of insulting people’s intelligence he wanted to make it clear from the outset that the Merseyside Fire and Rescue Authority was a standalone statutory body and not Wirral Metropolitan Borough Council. He said that in the same way the Chief Constable has responsibilities for operational policing, that he as Chief Fire Officer was responsible for operational fire and rescue cover on Merseyside. That was the context in which he was speaking that evening. The Chief Fire Officer is quite Right when he say’s his is a Stand alone Service, like the Police. However they are dependent to a great extent on Council Premises, Council Tax and Good Will of the Combined Authority in this case. It would then be up to whichever Service is Challenged to put forward an explanation as to why this has happened. I remember a Chief Constable was able to bring in to proceedings an Officer Complained about, as a Co Respondent, whether that is still the case who knows. As it happens, I am aware that each individual Officer is Responsible for his own actions and his Chief Officer can also be held responsible given the Book Stops With the Boss!!!!!!! Well the Chief Fire Officer is accountable to the politicians on the Merseyside Fire and Rescue Authority. The politicians on the Merseyside Fire and Rescue Authority in turn are both accountable to the public, the local councils that nominated them and the political parties they represent. The Merseyside Fire and Rescue Service is a standalone service. They are a separate body to the Merseyside Fire and Rescue Authority (who make the political decisions and are comprised of 18 local councillors (four from Wirral)). Just to be clear, fire is not one of the functions of the Liverpool City Region Combined Authority which has a transport (Merseytravel), economic development and regeneration remit. Decisions of either the Merseyside Fire and Rescue Service or the Merseyside Fire and Rescue Authority as they are both public bodies can be challenged through judicial review in the Administrative Court (part of the High Courts of Justice). The first stage in proceedings would be to write a pre action protocol letter challenging the decision of Merseyside Fire and Rescue Authority based on the recommendation of Merseyside Fire and Rescue Service (in this case the decision of 2nd October 2014 to proceed to consultation). I have seen a copy of a letter and a gentleman referred to judicial review proceedings (which as far as I know are not “active” yet) during the public meeting. Yes, Chief Constable are also held accountable in law for the actions of their officers. Hence why they can end up being a defendant on police related lawsuits. Forgive me Mr Brace, Who is the leader of the Liverpool Combined Authority?, as well as other hats he wears?, Where does the money come from to pay for the Respective Services on the Wirral? etc, etc. Right from a technical perspective there is no leader of the Liverpool City Region Combined Authority and there are multiple leaders of various Merseyside district councils (and Halton) on the Liverpool Combined Authority as well as the Chair of the LEP. Its Chair however (elected twice this year into that position) is Cllr Phil Davies (who is also the Leader of Wirral Council). The money bit gets a bit complicated when you refer to the respective services on the Wirral. You’d have to be more specific as there are police, fire, local authority (Wirral Council), NHS and other public body functions on the Wirral such as schools and sixth form colleges. I’ll try and be as simple as I can. Wirral Council collect Council Tax and business rates from Wirral residents and businesses. In addition to this they have income they raise through charges (whether these be for example planning permission fees, taxi driver licence application fees, library fines et cetera, grants they receive from the government, money they receive from selling their services to other public bodies, money they receive for administering the Merseyside Pension Fund, well it’s a very long list! Some of these taxes they keep for themselves. Some of the money is for a specific purpose eg health, education etc. Out of the Council Tax, some of the rest they send to the Merseyside Fire and Rescue Authority, some to the Merseyside Police and Crime Commissioner (previously Merseyside Police Authority) and there are probably other precepts too. Mainly the money to pay for the respective public services on the Wirral comes through a combination of taxes (whether local Council Tax or other sources), borrowing, income, charges & fees, income from land and leases (for example rent), bank interest and investments and other sources that off the top of my head I can’t recall right now. The main source of income for public services though are taxes (whether local, national or European). Are you meaning the Chair of the Merseyside Fire and Rescue Authority or the Chair of the Liverpool City Region Combined Authority? I am sorry for that out burst. I should know better by now. He’s also Leader of the Labour Group on Wirral Council (a party political office chosen by the Labour councillors). He’s a member of the Birkenhead Constituency Labour Party. He’s a member of the Local Government Association Workforce Board, Non-Executive Director of Wirral Chamber of Commerce and a Trustee of Wirral Foodbank. I look forward to reading your future comments. As to political matters, well they are subject (generally) to call in, the courts or internal appeal processes.